THE MOST SHOCKING THING THAT ANYONE HAS EVER SAID TO ME. In this blog I am going to tell you the most shocking thing that anyone ever said to me. You may notice that I have not blogged in several weeks but the silence has not been because of compromise or fear. I have stayed away from the blog… to prayerfully recalibrate its goals and its direction. I took a look back to the very beginning of this blog and assessed its direction in prayer. While I do not recant any of the things I have written it is clear that Christ is requiring of me a higher level of effectiveness in communicating. The most urgent balance that God is asking me to maintain has to do with winning souls in our nation. My entire foray into the political arena was solely because of my passion to win souls. I have always suspected that the greatest threat to evangelism in the United States is coming from the White House. This is not a leadership that is inspired by values but is driven by its animosities. Something had to be said and something still needs to be said about how our nation’s leader has targeted the gospel of Jesus Christ. That is why, you will continue to hear vital insights to how your faith is under assault, how God is asking you to take action, and the great hope that we still have for America to be one nation under God. When the Holy Spirit led me to begin blogging and to convey to you my audience the justifiable alarm that I felt over the loss of our freedoms the cancerous relationship between media and the White House I received a mixture of praise and condemnation unlike any I had experienced in my entire ministry. Take a close look around you and you will notice that many Christian leaders are now speaking out against our government that were formerly afraid to do so. The failure of this administration and its animosity toward Christian values is so blatantly clear to all that even the most squeamish pastor is now reevaluating their silence. There are two things we have not yet done in this blog: one is to ask you to partner with us to win souls across the United States and the other is to ask for your fervent prayer support as we lay the groundwork for a massive invasion of souls in 9 West Coast Cities starting tonight. It was the most shocking thing that anyone has ever said to me. What made it even more shocking is the person who said it to me. He is a man that I trust with my life. He is one of the greatest soul winners in history. He is a man that has weathered our nation’s worst storms in the last 60 years of ministry. He is man whose name you would immediately recognize. The White House is obsessed with a worship of government. They have such an irrational reliance on a higher power that it paralyzes all debate and consideration of cures outside of their god. Government worship has brought rampant apathy, a lackadaisical work ethic, and an incurable sense of entitlement. Our $17 trillion debt was born out of this blind faith. This God of government is a jealous God that will do anything to stay in power. This beast will make and enforce laws against any threat to its existence. It sees the Gospel of Jesus Christ as the single greatest threat to its power and is in full fury to ban it altogether. It uses the issue of contraceptives to remove religious freedom, the IRS to target preachers who oppose abortion and defend traditional marriage. It intends to abuse hate crime laws to silence people of faith, religious groups, clergy, and those who support traditional moral values. This is why it passed more laws in the last 5 years to hinder or ban soul winning than in the previous 237 years. 2. The entertainment industry’s war on Christians: Why does our popular culture seem so consistently hostile to the values that most Americans hold dear? Why does the entertainment industry attack religion, glorify brutality, undermine the family, and deride patriotism? Hollywood has broken faith with its public, creating movies, television, and popular music that exacerbate every serious social problem we face, from teenage pregnancies to violence in the streets. 3. Rampant apostasy in the church. Even old-line Christian denominations are modernizing their doctrine, bending the curve to accept things that are forbidden in the Bible. Hypergrace and new age hybrids of the Gospel downplay hell and the great commission. 4. Abuse of end time prophecy in the church. Many Christians see no point to winning souls because they believe that the events of today are a part of God’s plan for the end of the world. Let all who believe America is doomed read this: God had just pronounced judgment on Israel when these surprising words came from Joel 2: 12-14 “Now, therefore,” says the Lord, “Turn to Me with all your heart, With fasting, with weeping, and with mourning.” So rend your heart, and not your garments; Return to the Lord your God, For He is gracious and merciful, Slow to anger, and of great kindness; And He relents from doing harm. Who knows if He will turn and relent, And leave a blessing behind Him? The most powerful words to me are “Who knows.” Who knows if it is too late for America? Who knows if God may not have mercy on us one more time? There is the horrifying picture. At the very moment in history when America’s survival rests solely on repenting and returning to Christ, soul winners get a soul crushing double whammy: persecution from without and betrayal from within. And you know what? That is exactly what we are going to do. In the worst time ever for soul winning, we are going to mount the biggest West Coast outreach in our history. We cannot afford it, sleepy churches will not join us, and the hordes of hell will oppose it. We will rent arenas beyond our budget, wade into hellholes where we are hated and preach a message that experts say no one wants to hear. Because of all of this, we expect amazing results. Am I right about you? I have sent this letter to only an elite group of people. You got this letter because I believe that you love America and lost souls. I must test that belief and our friendship. In a different time and place I would not be so bold with you. I am asking you for a one time gift at the end of the year to fill our war chest. I am asking you to give perhaps the largest gift you have ever given to this or any ministry. Astonishing, isn’t it? America has fallen so far, so fast. This ministry has no choice now; we must empty our accounts, marshal every available soldier and charge into the harvest. Maybe you cannot go with me but your gift of love can. Your extra bold gift will buy us the precious tools to win souls, and lock in the venues where miracles will overflow. You will have a part in every life that is saved! Maybe you meant to give more this year. Maybe you haven’t given to this ministry in a long time. No matter what, make this your courageous stand against the destruction of America. 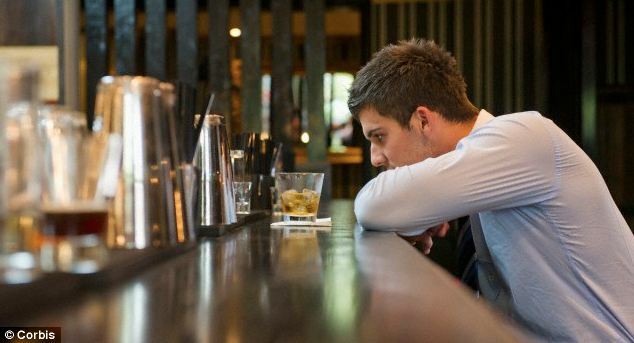 An anonymous person or persons armed with an AMEX Centurion card, a love for college football and an Instagram account is setting out to “do the Lord’s work, one tip at a time,” leaving thousands of dollars in tips to unsuspecting servers. The account has remained active ever since, continuing to leave tips of over $1,000 in bars and restaurants in cities like San Francisco and Chicago. And although tipsforjesus has received numerous comments of praise, and some of skepticism, the account has continued to keep its user’s identity a secret. The only clue that follows the generosity is the account’s love of college football. The signed receipts consistently show up in college town establishments on game days and include sentiments such as “Fight On!” Restaurant employees who have received the tips in Ogden, Utah, and Ann Arbor, Mich., say the anonymous person uses an American Express Centurion Card, more commonly known as the Black Card. 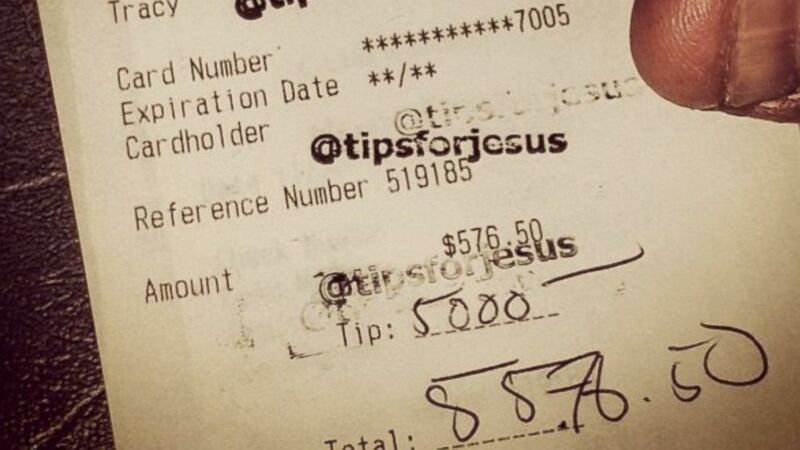 But while keeping their identity secret, the account is still verifying the large tips through signed customer copy receipts (now being marked with an “@tipsforjesus” stamp), and recently, they posted a photo of their online account activity to clear up a controversy concerning a Notre Dame University restaurant, where they left over $10,000 in tips in one night, that have still not been distributed to their servers. Tipsforjesus has posted little in the way of written explanations for their generosity, focusing only on photos of their tipping habits and leaving comments from inquiring news outlets unanswered. But that hasn’t stopped the account’s commenters, a large number of them wait staff requesting visits to their own establishments, from speculating about their reasons. Expert Testifies to Congress that Obama’s ‘Ignoring Laws’ Could Lead to Overthrow of Government. During a congressional committee hearing about the constitutional limits imposed on the presidency and the implications of President Barack Obama’s disregard for implementing the Affordable Care Act as written, one expert testified that the consequences of the president’s behavior were potentially grave. He said that the precedent set by Obama could eventually lead to an armed revolt against the federal government. On Tuesday, Michael Cannon, Cato Institute’s Director of Health Policy Studies, testified before a congressional committee about the dangers of the president’s legal behavior. War on Contraception? No, an Attack on Religion. That way of looking at the issue will be persuasive if your memory does not extend back two years. Up until 2012, no federal law or regulation required employers to cover contraception (or drugs that may cause abortion, which one of the cases involves). If 2011 was marked by a widespread crisis of employers’ imposing their views on contraception on employees, nobody talked about it. Ramesh Ponnuru is a senior editor for National Review, where he has covered national politics for 18 years. What’s actually new here is the Obama administration’s 2012 regulation requiring almost all employers to cover contraception, sterilization and drugs that may cause abortion. It issued that regulation under authority given in the Obamacare legislation. The regulation runs afoul of the Religious Freedom Restoration Act, a Clinton-era law. That act says that the government may impose a substantial burden on the exercise of religious belief only if it’s the least restrictive way to advance a compelling governmental interest. The act further says that no later law should be read to trump this protection unless it explicitly says it’s doing that. The Affordable Care Act has no such language. Is a marginal increase in access to contraception a compelling interest, and is levying steep fines on employers who refuse to provide it for religious reasons the least burdensome way to further it? It seems doubtful. Supporters of the regulation are resorting, as Jessica Valenti does at the Nation, to the slippery-slope argument: What if your boss is a Jehovah’s Witness and he doesn’t want to cover blood transfusions? Again, though, it has been legal for employers in most places to make this decision for most of American history. Ever heard of anyone going without a transfusion for this reason? The problem is wholly hypothetical. A lot of people, especially liberals, think that contraceptive coverage was a powerful campaign issue for the Democrats last year, contrary evidence notwithstanding. If that’s right, then liberals ought to have some success in getting Congress to pass the law with an explicit override of protections for religious dissenters. Until Congress takes such action, the courts should apply the Religious Freedom Restoration Act. Valenti also argues that opposition to the regulation “is not about religious freedom, it’s about sexism, and a fear of women’s sexuality.” It’s a free country, and people are entitled to adopt her cartoonish views of people who disagree with her. But our statutory right to act on our religious beliefs does not depend on what Valenti thinks of them. Thank — goodness. 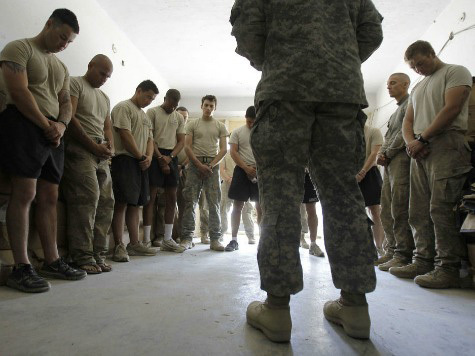 Talking to God boosts self-control and emotional stability, claims study. Researchers followed 159 patients over the course of a year at the Behavioral Health Partial Hospital program to investigate the relationship between a patient’s level of belief in God, expectations for treatment and actual treatment outcomes. Researchers found that patients with ‘no’ or only ‘slight’ belief in God were twice as likely not to respond to treatment than patients with higher levels of belief. The German authors recruited 79 people, of whom 41 were Christian, 14 atheists, 10 agnostic and 14 belonged to other religions. Participants were each left alone for five minutes and asked to either pray or think freely about one thing as intensely as possible. Next they all watched a funny film clips with half told to react normally and half required to try to suppress their emotions and control their facial reactions. Finally, they took part in Stroop tests, where words describing colours appear in different coloured inks, such as the word blue written in red ink. Participants must respond to the ink colour, not the written word, which requires self-control as our instinct is to read the word in front of us. Those who thought freely in the first part of the test and then tried to suppress their emotions during the film clips were found to struggle with the Stroop task. But this was not the case for participants who prayed at the start of the study – showing they still had high levels of self-control at the end. The authors also found those who first prayed had tried just as hard to suppress emotions during the film clips ‘but did not become depleted’.